Georgian Brilliance: Lacquer, Japanning and Vernis Martin, or Get the Matte Out of Here! 17th century Japanese chest sitting on an 18th century stand. Vernis Martin is on exhibit at Les Musée Arts Décoratifs in Paris. In English we might call it Martin’s Varnish, but instead we group all such decorative techniques under the heading japanning. 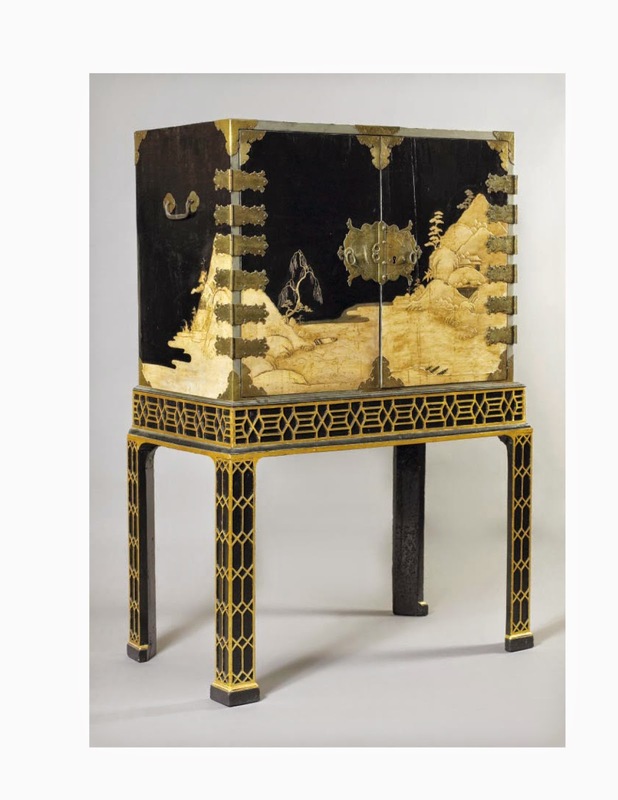 Japanning or Vernis Martin is imitation lacquer and it captured the imagination from the mid 17th century through the early 19th, encapsulating the long 18th century. Lacquer arrived in force during the early to mid 17th century from Japan via Dutch and Portuguese traders. The lacquered chest on stand is an example of 17th century Japanese work sitting on an 18th century stand. I can only imagine the brilliance of this piece when it landed at the London docks. New lacquer is dazzlingly brilliant. I have seen a few examples of late 18th and early 19th century lacquer that rarely saw the light of day or dust and they seemed to float in space. The black ground that forms the color absorbs the light at the same time that the clear lacquer layers above it reflect the light. Add gold and the pieces nearly vibrate. Additionally the black in these pieces falls into the black-brown family rather than the black-blue family of modern blacks. (Black-brown can look warmer to the eye than blue-black, providing counterpoint to the brilliance of the finish) The surface of most of the 18th century lacquer we see in museums has been abraded by centuries of dusting and cleaning lessening the reflective quality of the finish. 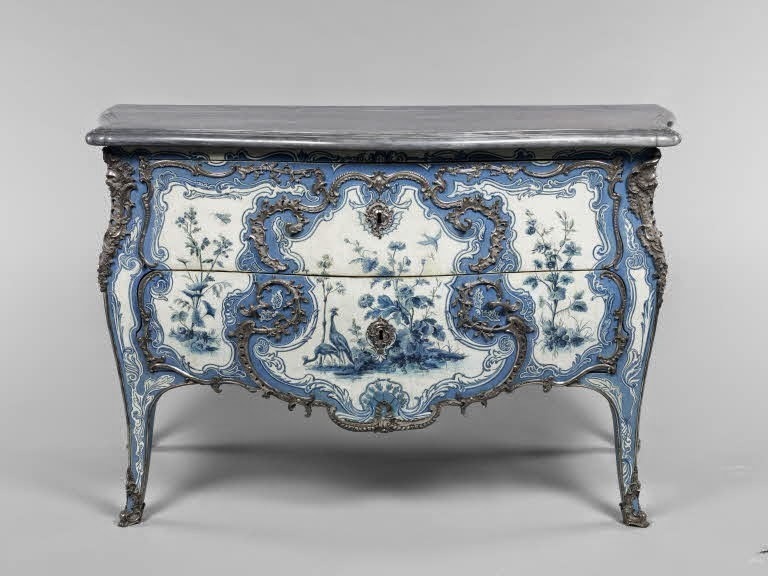 The 17th and 18th century Beau Monde went mad for lacquer, but it was an expense reserved for princes. The other problem was that it didn’t match anything anyone had. (A piece or two of Asian furniture is nice, but where is my chair and footstool, please.) There were early attempts to send unfinished European furniture to Asia to be lacquered, but the results were unacceptable. Each layer of lacquer required about ten days to cure and did so at about 90 percent humidity. With transportation, turnaround time could be three years; compounding this the lacquer fractured with the changes in temperature and humidity. Enter japanning the “new and improved” lacquer. Created with spirit varnishes (alcohol is the medium) with a short set time, or long varnishes (linseed oil and turpentine are the mediums) with a longer set time a cheaper alternative was developed and the rage began. Initially, long varnishes, less susceptible to moisture, were favored for exterior application such as coaches and sleds, but eventually they found their way into interior applications. The trouble with long varnishes is that they are dust magnets and when you are trying to create a brilliant finish dust is anathema. There are ways around this such as hanging damp sheets, but you can see where this all going, more effort than result. (Point of order, the reference to long varnish refers to the molecular chain not the cure time.) Back to vernis martin, working in Paris, brothers Guillaume and Etienne-Simon Martin created japanned pieces for the new trade. Each craftsperson, and yes women were japanners, concocted their own varnish recipes so that as the century progressed more variations were created. These recipes were considered craft secrets and most of these varnish recipes died with their creator or with the end of a craft family. Of all the varnishes, Copal varnishes were prized for their hardness and brilliance. Copal resin falls into several camps, some copal resins dissolve in alcohol while others require heating and the use of turpentine and oils, and some can be worked both ways. Most varnishes darken with time. However, one copal, rhus copallinum, from the American Winged Sumac produced a resin that according to old recipes created a colorless varnish when dissolved in alcohol. For those interested, a link below connects to an old encyclopedia of chemistry with descriptions of the actions required to create copal varnishes. 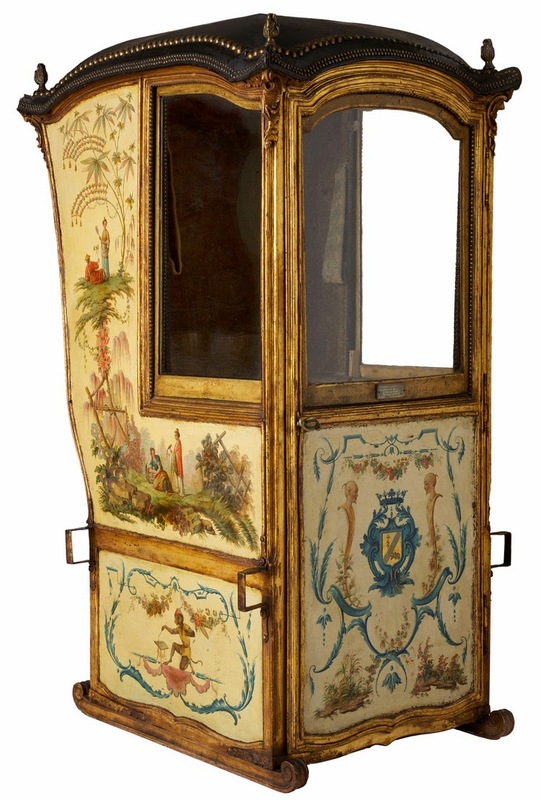 Everything was fair game for decoraqting; interiors, furniture, sedan chairs, even snuffboxes were japanned. In imitation of lacquer, black and red grounds were the initial colorings, but that soon expanded to blues, greens, yellows and that most elusive of pre-industrial colors—white. It wasn’t that white was hard to make there was always flake lead or calcium whites, the problem was the layers of varnish that covered the grounds. Over time, the natural tendency of varnishes to yellow or brown only enhanced the black and red grounds and took the candy wrapper edge off the gilded and bronzed decoration warming them. However, when creating white clarity is all and yellowing varnishes produce diminished work. The creation of a stable varnish to cover the white was a ticket to commercial success. Particularly when coupled with the other craze of the century, blue and white porcelain. Who didn’t want an en suite collection of furniture and clay that spoke to their exquisite taste? While the Martin brothers were known for their varnishes and techniques, they were equally admired for the clarity of their white japanning. One of their competitors in this aspect of the market as was the Dagly family who worked in Paris and had a family branch japanning in Berlin. 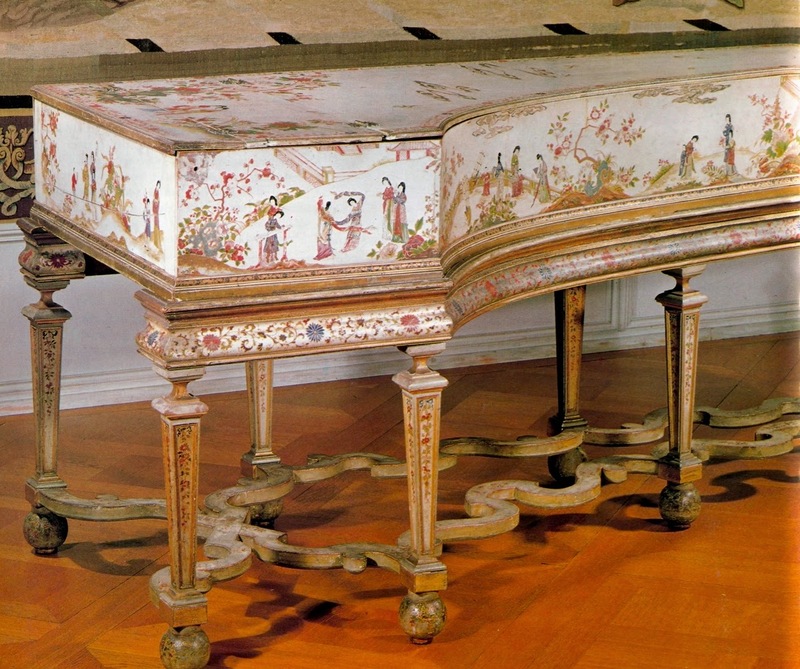 (Lacquer p.189-99) The illustration of the Dagly harpsichord illustrates the clarity of the desired white. 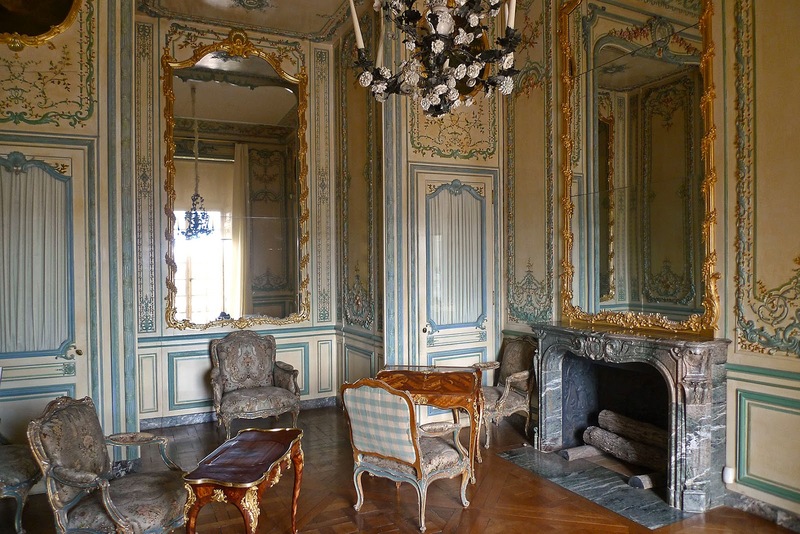 The next time you’re wearing your silk brocade gown or embroidered coat imagine the counterpoint that was once created by the interplay of textile, paint and gilt-work in a japanned room with japanned furniture. Some of the boiserie of the Dauphin’s apartments in Versailles was painted with vernis martin and the illustration gives an idea of the play of light, color and reflection that intoxicated the long 18th century. Lacquer, An International and Collectors Guide, Bracken Books, London, 1984.